I’m not sure how this book managed to escape my radar for so long. “This Organic Life,” written by Joan Dye Gussow, is a terrific read. Warning: If you don’t own/have access to somewhere you can grow things, this book can be frustrating. Here’s the thing: Ms. Gussow loves to garden. She loves it so much, that you’re going to want to grow things too. And not just a few things. You might find yourself at the garden center enviously eying people buying a fig tree, or a grape vine. You might find yourself secretly planting shallots between your landlord’s flowers. You might find yourself going to Home Depot and buying a GIANT box, then filling it with hundreds of pounds of dirt…. Yeah. That’s probably going to happen. Why? Well, it’s a very sensible (and wonderful!) thing to grow your own food. 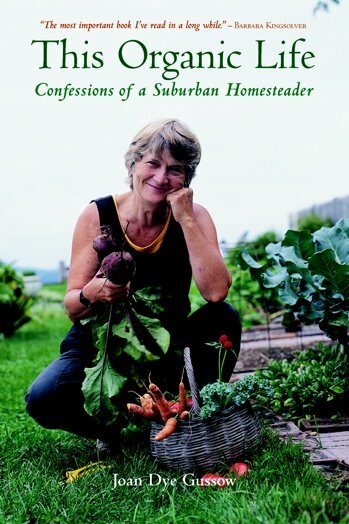 Joan Dye Gussow’s tale of suburban gardening is a terrific read. Gussow manages to inspire without preaching. She might live a life sustained almost entirely of things she grows, but she never expects the reader to. This isn’t a holier than though type of sustainable living read. Rather, it’s pure inspiration.